Looking for ideas to make your annual Easter egg hunt a bit more exciting? It’s hard to imagine that the prospect of an exciting church service, chocolate bunnies and jellybeans would need any help but just in case you were curious, we’ve got some twists you can add. From community-wide hunts to a family gathering, we’ve got something for everyone here in our list. Start with these seven Easter egg ideas. 1. Kids do the hiding! This egg hunt with a twist is great for a family gathering. After the kids search for eggs, allow the kids to hide them. Now parents get to find them! 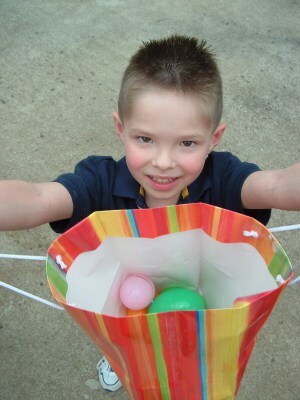 Children love this fun twist on an Easter egg hunt. 2. Are you hot or cold? This twist is great when your child needs help finding the eggs. As the child gets closer to the egg, you shout, “You are getting hot!” When the child gets further away from the egg, you say, “You are getting cold!” It may be cheating to give hints but it is greatly appreciated when you are just a little kid! 3. Host a night hunt. Teens are such an important part of ministry. Why not have an egg hunt just for them? Host a night egg hunt and give your teens some flashlights. Of course, safety first. Your egg hunt should be somewhere safe where there are no holes in the yard where someone can get hurt. 4. Stuff eggs with coupons. Put free pizza slice coupons inside plastic eggs. You could also add coupons for a free canned drink or maybe even a coupon from a local fast food restaurant. 5. Add an affirmation. We tell kids how wonderful they are but they need some affirmations from time to time. Put a simple affirmation in each egg along with the candy. Short affirmations like, “You are loved,” or “God has great plans for you.” These are treats they will remember for a long time. 6. Hide jigsaw puzzle pieces. Before you start stuffing eggs, choose a small puzzle. Put one piece of the puzzle in each egg. Once all the eggs are found, kids can come together to assemble the puzzle. 7. Assign kids colors. This is a great twist for assigning certain amounts of eggs to different age ranges. For example, the 3 to 5 year olds collect the blue eggs. You can always re-hide them and give hunters different egg colors. I hope you have fun with these Easter egg hunt ideas. I know I will! Tony Kummer (Editor) reviewed & updated this page on : April 3, 2014 at 8:32 am. All our content is peer reviewed by our readers, simply leave a comment on any post suggest an update.